The musiclovers had remembered legendary composer Omkar Prasad Nayyar, popularly known as OP Nayyar on his birthday on 16th January, 2011. He had died few years back, but his tunes had remained immortal for the audience of bollywood films for years. Whenever the name of OP Nayyar appeared in the minds of the audience, the name of immortal singer Mohammad Rafi had come together, without whom OP Nayyar was incomplete. OP Nayyar started his career with the film Kaneej in 1949. Rafi is certainly my sweetheart and I bet yours as well. 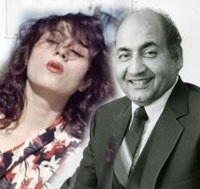 If you are a romantic at heart, Rafi saab’s voice is the eternal sound of love. And if you are not a romantic, you will become one at the mere touch of his mellifluous voice. His intoxicating and honey-soaked vocals can woo any hard hearted person. The warmth in his voice can thaw and melt anything frozen — be it a thing, human being, thought or an emotion. If you don’t believe me, listen to the songs I have listed below and be prepared to be hypnotized by his mesmerizing and soulful renditions. The Almighty has created 2 of the most wonderful & cherished personalities on this Universe, one with that ultimate velvet touch of voice which automatically became the Shehenshah of Taranum and the other with that ultimate beauty who came to be known as the Mallika-e-Husna and above all both thy names starting with that magical alphabet M = Mohammed Rafi and Madhubala. 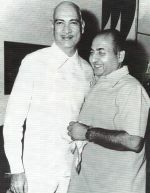 Both these personalities contributed their individual credibility in the Hindi Film industry and by virtue became immortal legends. 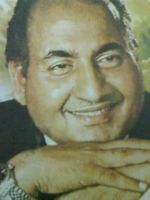 You are currently browsing the Rafians tribute to a true Maestro – Mohd Rafi weblog archives for February, 2011 .